In the bad old days of the web, the big trends were websites that rated you on various things. Most of them worked out to how attractive or not you were, or how nice certain body parts of yours were. Those have mostly died away in recent years, but they’ve been replaced by more professional commentary sites. LinkedIn, for example, is mostly used by professionals who leave comments on how good it is to work with other professionals in established networks. However, since it’s self-edited, you’re only getting the good stuff. If you want the down and dirty truth, then you might want to get Unvarnished. Unvarnished is the unrated, uncensored, unmoderated personnel rating website. 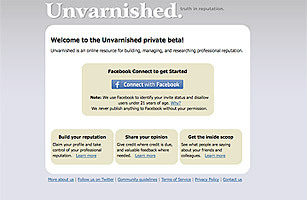 Unvarnished requires you to register for the site via Facebook, so they can verify your information and your age. Once you’re in, you’re in. Want to flame someone for bad customer service? Have at ’em! Want to rail about your incompetent boss? Knock yourself out! Want to praise someone for awesome work done really well? You can even do THAT! The fact that this website is unmoderated is really kind of frightening. There are controls in place to just prevent mass flamings or defamation, but the founders (who took part in sites like eBay and the aforementioned LinkedIn) say that the crucial element is that users can post their side of the story directly under the comments, whatever they might be. Yes, you can be smeared, but you can smear back, and that’s what matters.